Cinnamon Rolls can make a grown man cry! With that said make these for the favorite man in your life. You’ll be queen for the day or maybe for the week. This can be a no-brainer if you can make basic biscuit dough. If you’ve never made biscuits before just cut yourself a little slack and practice, practice, practice! My students love this lab! I’m not such a fan. I’m more of a savory person, but really can go for one of these with a good cup of coffee. So get in the kitchen and whip some of these mouth-watering cinnamon rolls up for someone special. Last spring GI Joe and I were in Halifax on a very cold, blustery day and walked into a very busy coffee shop Cabin Coffee to be exact. Guess what we found? Cinnamon rolls going like hot cake made with biscuit dough not the usual yeast dough. They were cooked in a huge muffin pan and as soon as they came out of the oven they were flying out the door. I’ve never seen anything like it. 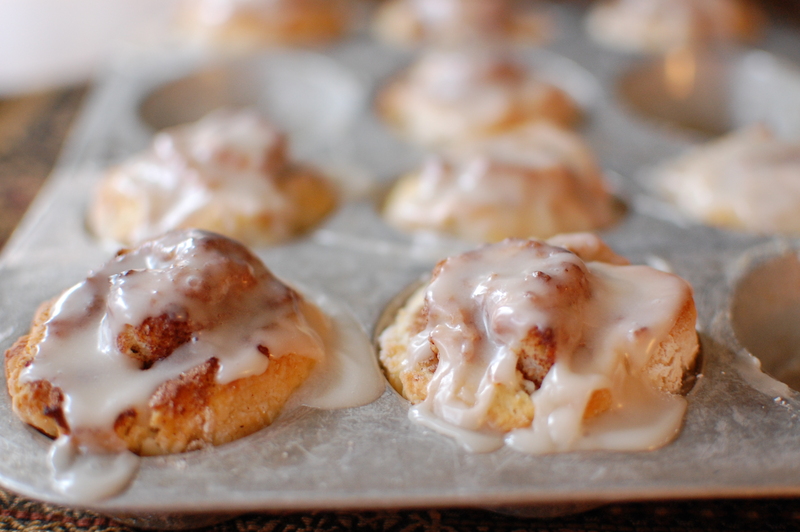 So here you go – my Cinnamon Rolls in a Muffin Tin. Yes, this is something else that you can enjoy with your family in this coming week of frigid temperatures. After suffering for three days with laryngitis, I was ready to demonstrate in silence how to prepare pancakes. But, a scratchy voice appeared on Friday morning and I was able to end my quick bread unit with some light and airy pancakes that will melt in your mouth . This recipe makes a very thick batter, but surprisingly not a heavy pancake. It is light as a feather and will absorb whatever topping you decide to choose. I used a recipe that I have seen floating around on many blogs. They are heralded as the world’s best buttermilk pancakes. You can be the judge of that. We thought they were fabulous! This school year has been quite a challenge for me for many reason that I won’t go into because I am working so hard to be a positive influence in my classroom. My students are absolutely wonderful! With the exception of a handful, all of them signed up for my class to learn how to cook. I have a large number of seniors that will be leaving their families for college next year and they want to be able to cook for themselves. I applaud them! If you’re in a hurry making Cinnamon Rolls from biscuit dough is the way to go. It is quick to put together and taste so good. This group of students had no big problems putting these things together. A couple of groups still need to work of kneading the dough. They haven’t quite got the knack of how much to handle it to make the end product light and fluffy. But, I really can’t complain because they were all better than usual. I had none that could break out windows. Pimento Cheese Biscuits and a Great Lab! Being the Southern Girl that I am I have had my fair share of fried chicken, deviled eggs, buttermilk biscuits, red-eyed gravy and pimento cheese! With that said I have just made the best Southern biscuits that I have ever had in my entire life. Yes, that is correct- my entire life! Oh, my gosh you have got to make these. I am telling you that they are so good that you will skip the rest of your meal. I have been on a search for the best waffle that is light and crispy and guess what? I found it. It’s Pam Anderson’s Light and Crispy Waffle from her cookbook Cook Smart. After reading the reviews from Food and Wine and Fine Cooking I knew that I couldn’t go wrong. I put it to the test in my classroom and they loved it, too. On Valentine’s Day while most people were having lunch with their sweetie, I was making pancakes for my angels. I have been a little of an overachiever lately. Two recipes in one class period and I think that I have gone a little crazy. I have used Bisquick for years because it is easy and students that are new to the kitchen can handle it. But, have you seen the price of Bisquick lately? It is sky high! And according to the paper today we are going to have a huge hike in most grocery items as well as clothing because of the weather. Anyway, I made one from scratch and the recipe from the Bisquick box. Guess what the scratch recipe won hands down. Not surprising to me.